Those of you who live in Essex County, New Jersey, already know that the weather can change drastically from day to day. Whether it is the summer thunderstorms, hurricane season, or freezing winter storms, the chances of you losing power are extremely high. No one likes to be without power. To some it could be more than an inconvenience, it could be life threatening. At Bloomfield Cooling, Heating, & Electric, Inc. we offer an outstanding team of certified service technicians who are fully prepared to install and maintain the best stand-by generator brands in the industry. 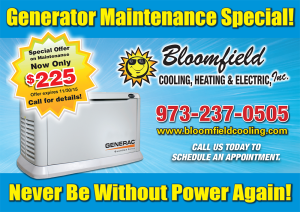 Bloomfield Cooling, Heating, & Electric, Inc. has been installing Generac and Honeywell stand-by generators in Essex County and throughout New Jersey for almost 30 years. We have been doing it with a standard of excellence that has been licensed by Generac Power Systems, Inc. With the expertise and care that our certified technicians provide you, you will see the difference in the quality of service and the quality products we are able to provide for you. Our certified technicians will help you select the right model with the right amount of power required for your home (7kW to 22kW). We provide excellent service from start to finish. Our technicians are there to guide you through the entire process. To make sure that your stand-by generator is working properly, we will mimic a power outage at your home and ensure that the generator is working properly. Before we leave, we will answer all of your questions and make sure that you are confident with everything you need to know in order to operate your generator whenever it is needed. We are also fully trained to trouble shoot any maintenance or repairs that your system may need. Cedar Grove, West Orange, Montclair, Bloomfield, South Orange, Verona, Belleville, Glen Ridge, Nutley, Caldwell, Maplewood, Short Hills, Millburn. 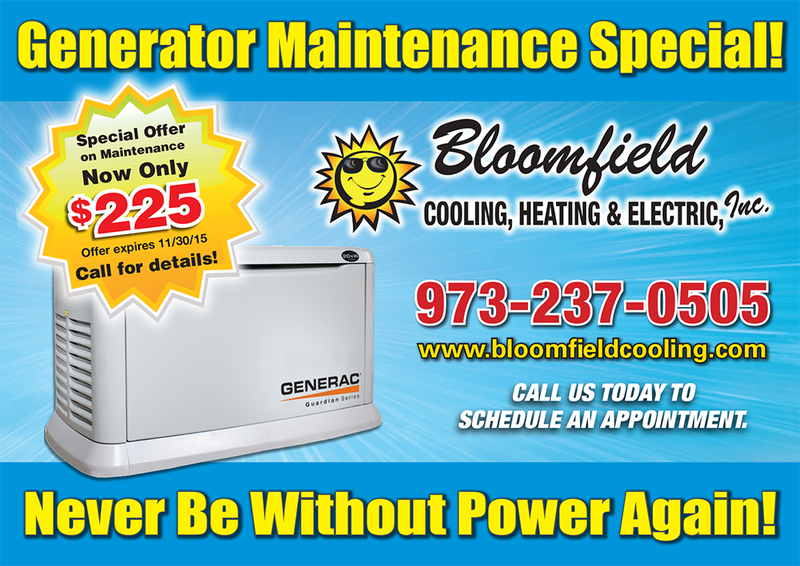 Check out our generator maintenance special!